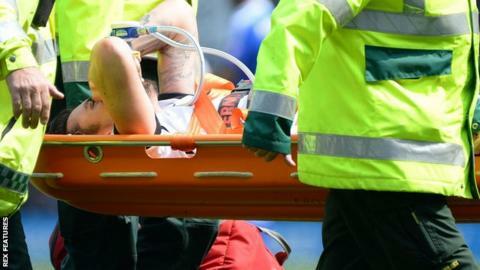 Derby County midfielder George Thorne will miss his side's play-off campaign after suffering a double leg break, the Championship club have confirmed. Thorne, 23, was hurt in Saturday's 1-0 home defeat by Ipswich and is expected to be out of action for three months. The Rams face Hull City in their second-tier play-off semi-final. "Would love to be involved in the play-offs but not to be. Wishing my team-mates all the best!" ex-West Bromwich Albion man Thorne said on Twitter. Ipswich midfielder Jonathan Douglas, who was involved in the incident with left Thorne injured, had earlier posted a message on social media wishing the Derby man a "speedy recovery". Douglas added: "Absolutely gutted with what happened with George. In no way did I intend on hurting him - I was just trying to block his shot and help my team. "I did apologise to him on the pitch and would like to put it on record again that I am sorry." Thorne has played 36 games for Derby in 2015-16, having missed most of the previous campaign with a serious knee injury.